What happens if there are other Pronto clients in my area? In most major metropolitan areas, we have multiple clients. During the third phase of our On Boarding process, we will ask you about your local competitors' websites. This is to determine if an existing client and new client are competitors. In that case, we make special efforts to differentiate the sites. Beyond that, we look at every client within a 50-mile radius of each other, and do a number of things to ensure their websites, blog contents, and newsletters are different. In terms of SEO, our goal is to get you up on the top of Google search results across a range of keywords. If there are two clients optimized for the same keywords, we don’t have the micro-control to stack rank them. We make the same effort, and depending on a number of other factors: inbound links, age of domain, site content; one might rank higher than another. If there is ever a concern, please bring this to our attention at once. We’ll work aggressively to address any issues. 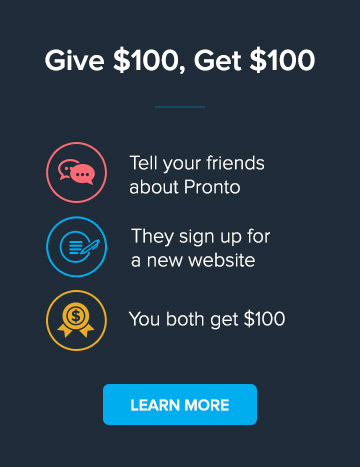 What happens to our website if we cancel with Pronto?